Last week, AT&T held its co-called Shape event in San Francisco. On the agenda: progress with its AirGig solution, initial commercial 5G markets for this year and 2017 virtualization goals, and success in moving continued development of its ECOMP platform to the Linux Foundation. Coming out of the event, an article from SDxCentral called out that these last two items were intrinsically linked – open sourcing ECOMP is critical to helping AT&T execute on its long-term virtualization goals. What that article didn’t do, however, was explain how they were linked. 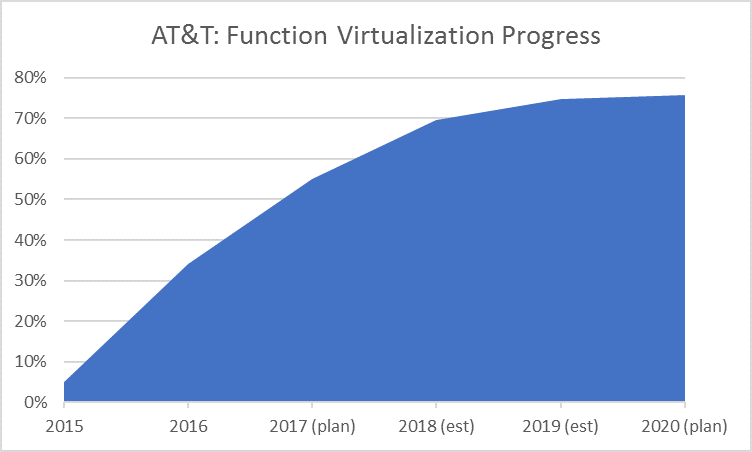 Let’s start, then, by looking at AT&T’s progress with network virtualization vs. its near-term and long-term goals. In 2015 it kicked things off by virtualizing about 5% of its network functions. At the end of 2016, that figure was 34%. On the way to its 2020 goal of 75% virtualization, the 2017 goal is 55%. Based on the incremental progress in virtualizing functions from 2016 to 2017, we can estimate what 2018 and 2019 look like. This is just a guess based on the progress to date and future goals, but it seems reasonable. Even if AT&T reaches its 2020 goal early (and, odds are, it will), the message is clear: incremental progress will wane. Put another way, the heavy lifting has been done. The functions that were easy to virtualize – VNFs that were readily available – have been implemented, or will be this year. Going forward, virtualizing the rest will only get more and more difficult. Where will AT&T find support in virtualizing the rest? It could lean on its traditional network vendors. But if AT&T is ahead of the curve in virtualizing its network functions, those suppliers will have plenty of work to do with their other customers – and plenty to keep busy with supporting other customers with the same VNFs AT&T has already tackled. So, where will it turn? It will need to turn to specialists, start-ups and other alternate vendors – along with the “big guys” that have traditionally supplied its network needs. And it will need to integrate them all together in a seamless way. That’s where ECOMP comes in. ECOMP may have gotten AT&T this far, but to get to its 2020 virtualization goal the carrier will need to do things going forward that it hasn’t done before. Leaning on a broader set of developer resources (the open source community) should help.